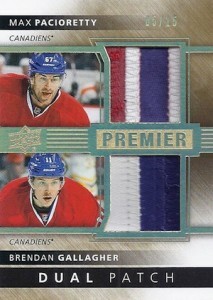 It has been more than a decade since Upper Deck's high-end Premier line last released as a standalone hockey set. 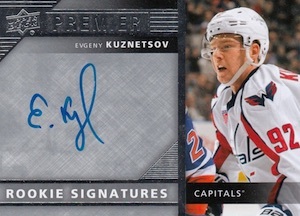 2014-15 Upper Deck Premier Hockey sees it return with the same sort of appeal. Seven-card boxes, which are packaged as tins, come with five total hits. Kicking things off is the promise of one Rookie Auto Patch card. Not only do these come with a signature and a premium swatch, but they're done on acetate card stock. 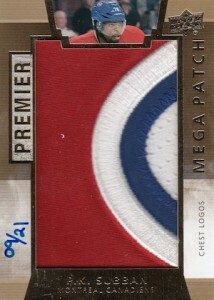 For memorabilia collectors, Mega Patch cards come with jumbo swatches measuring 1.75" by 2.75". Basically, they take up much of the card. All Mega Patch cards come from game-worn jerseys, even rookies who usually have event-worn swatches during their first year. Patches come from things like chest and commemorative logos, sleeve numbers and more. Mega Patch Duos are also randomly inserted with two players. 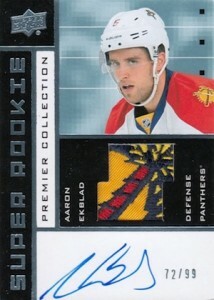 Super Rookie Premier Collection Rookie Auto Patch cards borrow from the brand's history. The cards use past designs to deliver first-year signatures and memorabilia. Besides base versions, much of the autograph and memorabilia cards come with different levels of parallels numbered as low as 1/1. 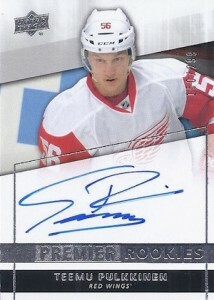 2014-15 Upper Deck Premier Hockey tins also have a pair of base cards. The set has both veterans and rookies. 60 cards. Serial numbered #/249. 42 cards. View all the Acetate Autograph Patch Rookie cards in a detailed gallery. 24 cards. Serial numbered 1/1. 23 cards. Serial numbered #/99. 23 cards. Serial numbered #/25. 45 cards. Serial numbered #/75. Can’t wait for this product to release. Love both the old and new designs. Was my favorite product for a few years. How about a pre-sell price point? This is the reason I have stopped buying packs and possibleresan why im getting out of the hobby! Jeff � What are you reasons? If people just say they like or don’t like something, those sorts of comments don’t add much to the conversation, which is a big part of having comments in the first place. That’s why your original comment was not posted. Im confused. 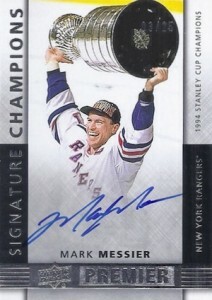 Does this product land somewhere between of Ultimate Collection and The Cup? back in the 90’s upperdeck and others massed produce cards and the hobby started to die and now putting out cards at high prices is taking away from the people that cant afford them like kids .I used to do shows and lots of kids used to collect now I go to shows and where are the kids????? they don’t collect because their allowance wont let them. This area is high is not for kids. This product is my second favorite next to the Cup. I am so glad UD is bring this back. Wow!! Jeff they still make packs for kids in their price range. What about Walmart and Target retail packs !! Come on Jeff really!! No one tells you to buy. But to say this is why you are getting out of the hobby. Really ! This could be the sleeper product of the year. 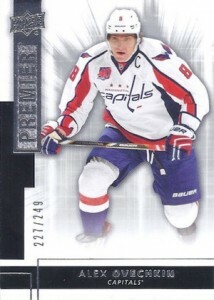 With Panini gone, this appears to be taking the place of Prime, which was always a hit with the collectors. 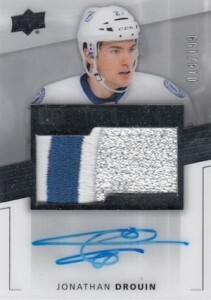 Would be great if they have a limited Rookie Patch Auto list, or short print certain ones as they do with the Cup. Price will deter some (why it lost a star as it is price 100 more than Prime at release) but the thrill of the chance will grab many. Do we have a release date on this product yet? Save your money for 15/16 boys. It’s just like prime, and prime is a loss everytime you open up a box. At least with products like Masterpieces, S1/2 and SP, OPC Plat you can recoup on insert cards on opening day/week. If you get a bad box, which is more likely then not as per the odds here, plus due to the rookie class, are you will to take that $100 hit? I’ll wait for 15/16 to go hard. Awesome product but overpriced to me. should be around 225 in the range of where prime was. I’m with Zach. 15/16 will be a filthy rookie class with Eichel, Strome, McDavid…. Full Strength Cards, quit whining. you have high end cards on your ebay account…..and they are over priced. High end product is fun for the gamblers. Keep it up UD! Jeremy, not sure what you mean with the whining. The Comments are below the person’s name. I gave it 4/5 and it only lost a star because of the price difference between Prime. Will be a great product!! I buy many cases of the Cup, Ultimate and Treasures football and Immaculate basketball. Too me this is a mini Cup. In between The Cup and Ultimate> Go for it and enjoy. A risk yes but a solid return. lol….soooo many reviews for a product that hasn’t even been released yet. Interesting. Alan nailed it – I see this as an in-between Cup and Ultimate as well. Good luck on your breaks everyone! The product looks good, but where is Alexander Ovi and Crosby. Checklist looks weak. Johnny Gaudreau is redemption this year. I am still waiting Mackinnon last year autograph. This might be the best product I’ve seen. The rookies are amazing. 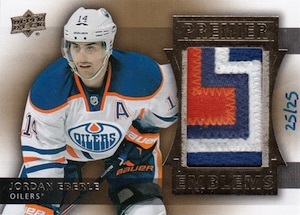 The patches are incredible, and the cards are low-numbered. This product is going to sell out fast. I watched multiple breaks on the CloutsnChara breakers channel and was amazed by the hits they pulled. Hit after hit…. Just amazing. Wow, What a pile of Upper Deck Junk. So over-priced! I have watched numerous breaks, and without a doubt, box after box of junk. 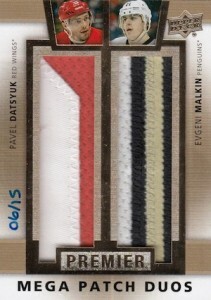 Nice patches on bad rookies. As a bigtime collector, I just want to say that you will be lucky to recoup half your investment! I watched a lot of breaks tonight and if you in it to make money instead of collecting, forget buying any products. Prime was so similiar in so many ways. You will lose money no doubt, it wasn’t that appealing to me after the first case. I have to say I’m very imrpessed with the product as I sat through around 10-12 case breaks last night. Gorgeous patches left and right. I don’t know if anyone else witnessed this but there was an ABUNDANCE of Adam Clendening RPA (honestly, I’ll say 7 were pulled from the 10-12 cases)…and I did not witness a single Gaudreau RPA in all of those breaks which was very odd. I would say you just about break even on your investment barely if you were to purchase 1 box/tin…but you’re honestly just better off to partake in group breaks or purchase your cards of choice directly. Way TOO many Parallels etc ~ Kids Cannot afford these products ~ Kids Buy Retail at Wal-mart or Target? ~ Don’t they also deserve a shot at a nice Hit!! not a bunch of overpriced garbage ~ Again with the monopoly handed back to UD it’s the 90’s all over ~ Mass Redemptions again!! ~ Ever tried to have a damaged card replaced by UD? ~ GOOD LUCK!!! ~ UD wants reciepts etc who gives reciepts out at Card Shows?? ~ Bottom line is if you collect great, if you re-sell FORGET IT!!!! I agree with Jeff in the late 70’s when I started to collect, a kid could get a very nice and valuable card , now you have very little chance. I have a very good job but I can’t justify spending 275 dollars for 7 cards. Thai hobby has changed badly and not for the best. Make fewer sets put these expensive brand in a pack of upper deck series 1 or 2 and everyone has a shot. Make them hard to pull. Rich people can still buy them if they really want them. It’s not a hobby. It’s gambling pure and simple.